Problems posed by Syria s chemical weapons attacks, Egypt s ouster of an elected government, and myriad other global dilemmas beg the question of whether and how the world can be governed. The challenge is addressing what former UN Secretary-General Kofi Annan called Problems without Passports environmental, economic, humanitarian, and political crises that threaten stability, prosperity, and even human survival. Everything is globalized everything "except" politics, which remain imprisoned behind national borders. The world has changed, but our basic way of managing it has not. We pursue fitful, tactical, short-term, and local responses for actual or looming threats that require sustained, strategic, longer-run, and global actions. 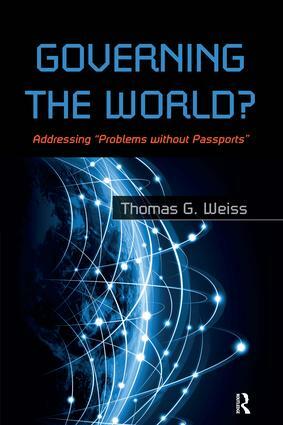 With clarity and passion, Thomas G. Weiss argues for a diversity of organizational arrangements some centralized, some decentralized and a plurality of problem-solving strategies some worldwide, some local. He proposes a three-pronged strategy: the expansion of the formidable amount of practical global governance that already exists, the harnessing of political and economic possibilities opened by the communications revolution, and the recommitment by states to a fundamental revamping of the United Nations." "Tom Weiss's book is published in the International Studies Intensives (ISI) series which is addressed at students and intended "to offer an intensive introduction to subjects often left out of the curriculum." [I]t achieves this objective, and more, by providing an introduction to the state of the field of International Relations (IR) studies and helpful bibliographic leads for more intensive reading. As a survey book, Governing the World? amply illustrates the ever increasing chasm between pressing global problems and the woefully inadequate institutions charged with resolving them." International Studies Intensives (ISI) is a book series that springs from the desire to keep students engaged in the world around them. ISI books are meant to offer an intensive introduction to subjects often left out of the curriculum. Our authors are from a range of disciplines and employ many different methodological approaches to teaching about international issues. Yet each and every ISI book packs a wealth of information into a small space, and does so in ways that students find compelling and instructors find useful. ISI books are relatively short, visually attractive, and affordably priced. Examination/inspection copies for course adoption may be requested from the Webpage of any book in the series. Book proposals for the series should be directed to the co-editors: shareen.hertel@uconn.edu and mbutler@clarku.edu.